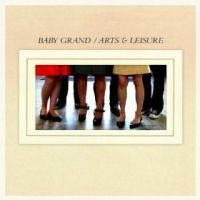 As 'Arts & Leisure' is the fourth album from Baby Grand, there's a good chance you will already be familiar with them. Personally this record was my introduction, and so I took to the good old internet in search of some information, and found that things didn't quite add up. Baby Grand are Australian, fine; they're an all girl band, OK, puzzling that there are male legs on the album cover though; amongst their list of influences are No Doubt, Garbage and Paramore, er, this is getting a bit confusing; their singer is described as a "powerhouse" and they're working with writers whose credits include the likes of Justin Timberlake and Christina Aguilera. Stop right there! Unless there's a belated April Fool's gag going on, something isn't right here. A quick listen to the blissful indiepop that makes up this album, the kind it's impossible to describe without using words like 'Belle', Sebastian', 'Camera' and 'Obscura' and it becomes apparent that there are at lease three identically monikered groups out there. So avoid the Aussie lot and use the links below to negotiate a safe path to this Californian sextet instead. Sacramento may be their home but this dainty, breathy, adorable guitar-pop is so universal it could be from Glasgow, London, Stockholm or Paris. All is suitably traditional and, importantly, suitably accomplished. Some will see that dreaded word, 'twee', and run a mile, but more fool them for missing out on some beautifully arranged, brilliantly written tunes. You'll find more meat on a butcher's pencil, but try resisting the dancing melody of 'Fool For Your Love' or 'Can't Keep Us Apart'. Indie's link to 60s French pop is explored once more on the continentally infused 'Quand Tombent Les Ombres'. The twinkly 'Skyline' is more sighed than sung in a manner that makes The Sundays seem like Babes In Toyland by comparison. 'I Know This Is Real' could be Saint Etienne gently remixing The Cardigans. So it turns out that both their influences and their output are a far more savoury proposition than their namesake's after all. Phew.